Timeshare Marketplace Instructions - Sell your timeshare for free!! This page will serve as an instructional page on how to post a new Timeshare Marketplace Classified ad. I will be submitting a Regular For Sale - Fixed Week Classified ad in the example below. This is the TUG Timeshare Marketplace Homepage, all For Sale, For Rent, For Exchange, and Wish ads are placed here! Step 2. CLog in andlick on "place new ad"
As you see highlighted by the red arrorw, the PLACE NEW CLASSIFIED AD link is only available if you are logged in as a TUG member. Also note the difference between the CLASSIFIED ADs (want to sell, want to rent your own timeshare) and the WISH ADs (want to buy, want to rent someone else's timeshare) and ensure you are posting the correct ad type! Step 3. Read the Ad Section warnings and suggestions completely! It really is recommended that you read these before you post any ad as they serve to protect you from scammers as well as learning the right way to sell your timeshare before you post your ad! 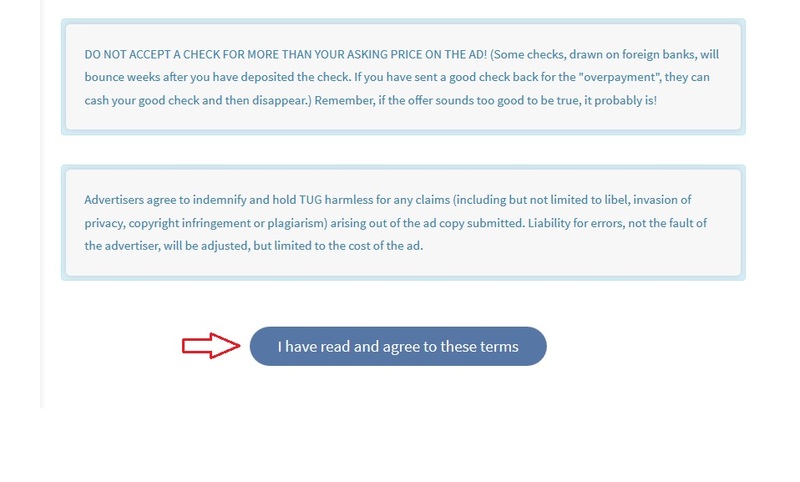 You must scroll down to the bottom and click "I have read and agree to these terms"
Click each of the drop down boxes in order to select and indicate the details of the classified ad you are lising for Sale (or rent or exchange). 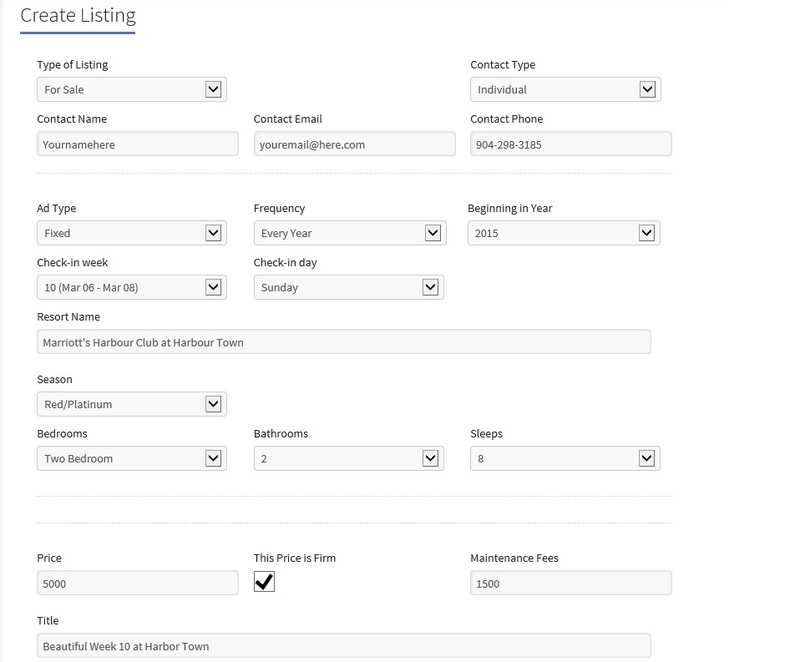 Also be sure to type in a descriptive title and description for your ad to attract buyers browsing the marketplace! Once you are satisfied the information is correct, click SUBMIT LISTING at the bottom of the page. *note when typing in the resort name, begin by typing in a single unique word contained in the resort name, and then select the appropriate resort from the drop down list that will appear for you. Once you click submit, you will be immediately taken to your "MY Classified Ads" section that displays the ad you have just submitted as well as any and all ads you have submitted on TUG in the past. As you see the status of this ad is PENDING, as all ads go into an approval queue and will be published within 24 hours. Nothing more is required of you to get your ad posted, we take care of the rest! You can come back here at any time to edit your ad to make any changes you wish! *note this is also where you would go to view any messages sent to you regarding your ad. Step 6: Check back Regularly and respond to Messages! One of our biggest complaints is individuals not responding to ad messages. It is very important to check back regularly to view your messages as many times our "notification" email will get trapped in spam filters or junk email folders and go unnoticed. This is the very reason we keep the original messages stored on TUG with your ad (it wont ever be deleted unless you click delete) and will remain there forever as a record! Also be sure to mark your ads as sold or rented as applicable to ensure the accuracy of ads in the Marketplace! Note that ads by default will expire 90 days after posting if they are not renewed! You will get an email notification that your ad is about to expire within the next 10 days, and after logging back in you will see a new link allowing you to "extend your ad" an additional 90 days! 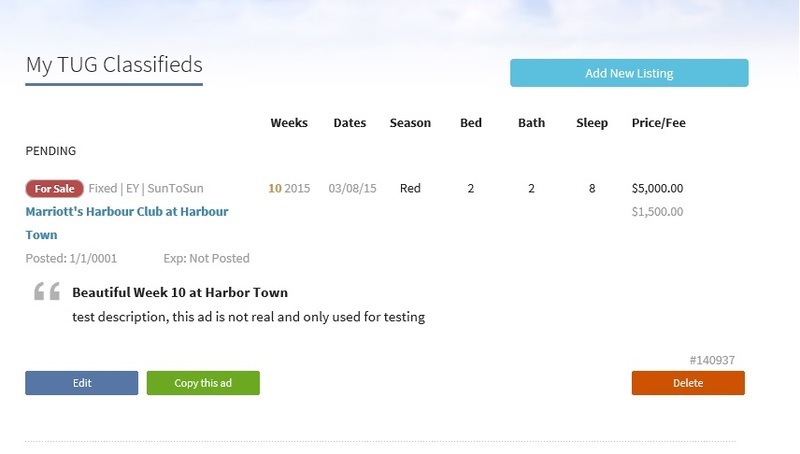 We hope this article helps you with posting ads in the TUG Timeshare Marketplace! Go post your ad today! Place new Timeshare Ad Now! Feel free to stop by our Timeshare Community Forums if you want to ask specific questions, with more than 60,000 other Timeshare owners and experts, no question goes unanswered!